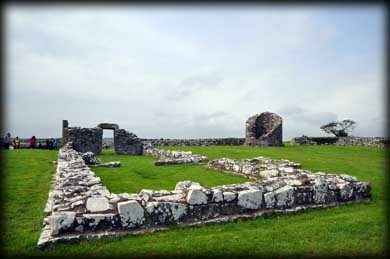 Traditionally the monastery at Nendrum is believed to have been founded by St Mochaoi in the 5th century. 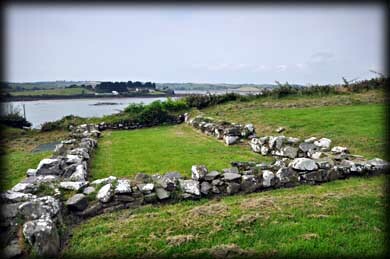 It is situated on Mahee Island, the phonetic spelling of Mochaoi, on the west shore of Strangford Lough. The island is six miles south of Comber, County Down and is now accessed by a series of narrow roads and causeways built in the last century. There is no evidence of the early monastery, but there are excavated finds and annalistic records showing active occupation in the mid 7th century. From the annals of the four master we know that Setna Ua Demain, an abbot of Nendrum, was burned in his house in 976, probably during a Viking raid. 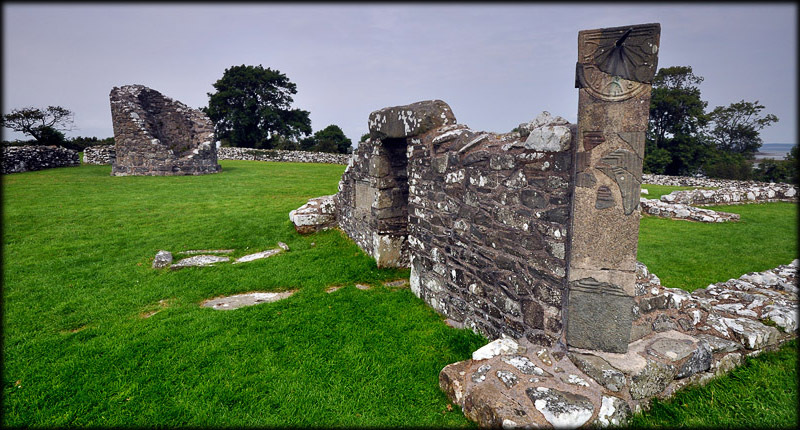 There is no evidence of occupation after this event until 1177 when John de Courcy, an Anglo-Norman knight who invaded Ulster, gave Nendrum monastery to the Benedictine house of St Bees in Cumberland in order to establish a cell. John de Courcy is also credited with building the castles at Carrickfergus and Dundrum. By 1306 Nendrum was named in the papal taxation list as a parish church. 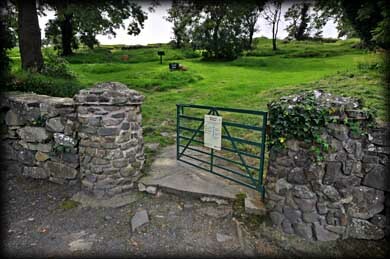 In the 15th century the island church was abandoned and a new parish church was established on the mainland at Tulynakill. The monastery was lost for centuries until 1845 when William Reeves, searching for the churches on the 1306 list, rediscovered the site at Nendrum, See Round Tower page. In 1922 the site was excavated by H.C.Lawlor. The site consists of a monastic enclosure defined by three concentric walls. The outer walls enclosed about six acres and probably contained houses, gardens, orchards and arable land. In the south west of the middle enclosure are a series of circular platforms that supported timber huts. After later excavation finds it is believed these were workshops. 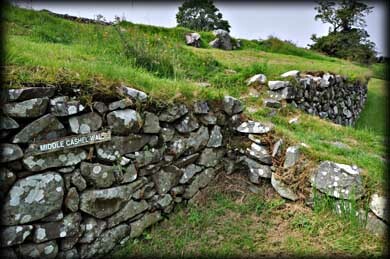 The stone foundation north of the huts is known as the schoolhouse and contained many carved stones thought to be "trial pieces" bearing interlacing and animal decoration. 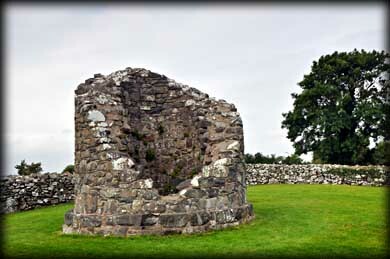 Inside the inner enclosure is the stump of a round tower and the remains of a 10th or 11th century church. 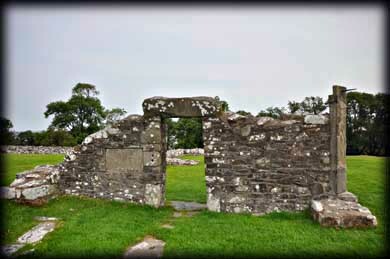 The west gable was reconstructed and has projecting side walls known as antae. These would have acted as support for the roof. 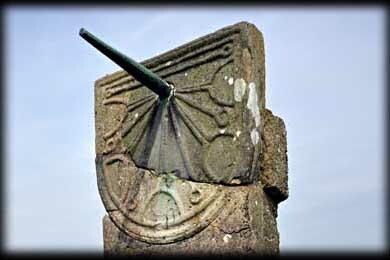 At the south west corner of the church is a possible 9th century sundial reconstructed from fragments found by Lawlor in 1924. Situated: From Comber head south on the A22 take first left. After 3 mls turn left on to Ringneill Rd. 1.8ml turn right onto Reagh Island. Continue on to Mahee Island. 1.1ml keep right at the fork, Nendrum monastery is on your right. Discovery Map 15: J 5235 6365. Last visit Aug 2012.